As the harvest season draws to a close at Heritage Farm, we reflect on the bounty of another fruitful growing season. Pickups rumble past my window, their beds piled high with colorful squash. The barn is lined with tables of drying tomato, pepper, and eggplant seed. In the loft above, garlic and sunflowers drape the rafters. We’ve come a long way from the Seed Savers Exchange (SSE) of 1975, when our collection consisted of exactly two seed varieties and one grand idea. Seed Savers Exchange is a non-profit working to share and save heirloom and open-pollinated seed. We are delighted to celebrate this bountiful harvest, 40 years in the making. Today, Seed Savers Exchange is comprised of a collection over 20,000 varieties strong, a highly professional staff, new technology in their capable hands, 13,000 active members, and generous supporters like you to thank. Every year for the last 40, support from conscientious donors has allowed us to increase our commitment to the safekeeping and propagation of heirloom plant varieties. We cannot do the work of preserving our garden heritage without you. Imagine how much more we will accomplish in the next 40 years with your help. Please consider showing your support for Seed Savers Exchange by making a donation. Biodiversity in gardens and at the dinner table, which means more colorful, unique, sustainable options for your yard, and more flavorful, nutritious options for feeding yourself and your family. Scientific best practices and historical preservation. You allow us to do excellent work in preserving our 20,000-variety collection and in preserving the unique histories of each seed. We are charged with the safekeeping of both seeds and stories from people around the globe, and your donations allow us to do our best work for those who need us. Sustainability and adaptability to change. The self-sustaining practice of saving seed allows heirloom and heritage varieties to adapt to changes in growing conditions over time, an important asset in a changing climate. Education. We offer resources, hands-on learning, and online tutorials to teach gardeners and seed savers of all skill levels how to save and share seeds. Community food and community gardens. Our programs help educate new gardeners and new seed savers, enabling communities to become more self-reliant for affordable, nutritious, fresh foods. We put your donations to good work. A few years back we asked for help in expanding our historic apple orchards. Thanks to our generous supporters, we now have more than 900 varieties in our orchards, approximately 20 percent of the known varieties that exist in America today. And in 2015 we will be offering 40 of these heritage varieties in our catalog so that orchards and yards across the country will once again be planted to these rare apple trees. So successful have our first four decades been that each year we are able to introduce family heirlooms from our own Heritage Farm Collection not only through our yearbook exchange, but also through our catalog, making them accessible to gardeners everywhere. These varieties reflect thriving garden traditions from Massachusetts to Texas to Oregon. In our 2015 catalog, we make available ‘Sand Mountain’ sorghum from SSE member Michael Adamson, whose family has used the variety to make flour for pancakes and the sorghum syrup to pour over them since the 1920s. By planting ‘Sand Mountain’ sorghum in our gardens and enjoying it on our tables, we protect a treasured variety. Seed Savers Exchange protects heirloom seeds so that they can be grown and enjoyed for generations to come. Saving and sharing seed is at the heart of what we do. Our collection contains thousands of family heirlooms, entrusted to Seed Savers Exchange for preservation. 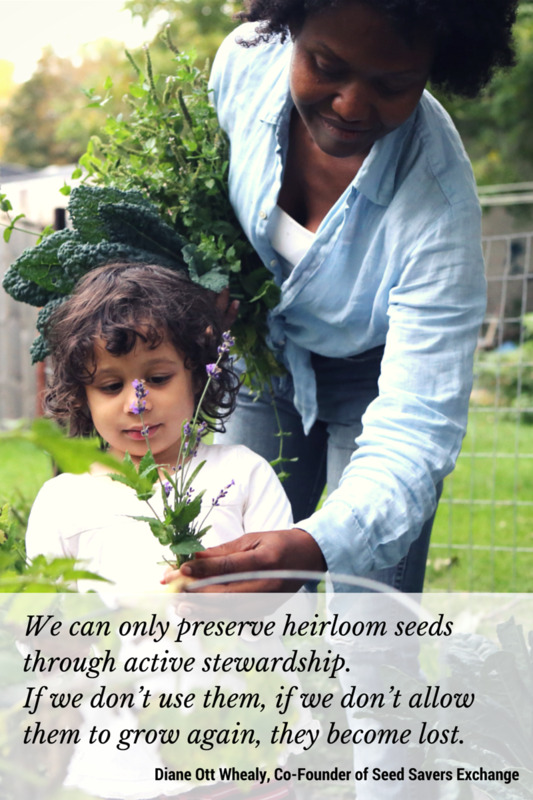 Unlike any other type of family heirloom – an embroidered handkerchief, a pocket watch – we can only preserve heirloom seeds through active stewardship. If we don’t use them, if we don’t allow them to grow again, they become lost. We have a squash variety in our collection from SSE member Norman Turner. He sent us the seeds of the ‘Turner Family Original’ squash in 1992 with a letter describing a pie pumpkin raised by his family in Pennsylvania “for at least three generations.” He urged us to “keep this valuable fruit going” as he aged, acknowledging that his children may not “continue to propagate it as previous generations of the Turner family have.” Offered frequently in our yearbook exchange from 1992 to 2011 and now grown throughout the country, the ‘Turner Family Original’ squash is safe in our care. As proud as we are to look back over our first 40 years of growth and success, we know there is much work left to do. Every year, more and more farmland is used to raise patented, genetically engineered seed, making our heirloom and heritage gardens increasingly important. Together with a new generation of seed savers, we look toward the next 40 years resolved and optimistic. Early in 2015, we will publish The Seed Garden: The Art and Practice of Seed Saving, a comprehensive, illustrated guide for both experts and newcomers to seed saving. The book reinforces our Community Seed Resource Program, which provides tools and guidance to seed-saving community groups, helping us reach ever more seed savers. At this time of year, when heritage and tradition ask us to prepare meals with extra care, to spend time with our families and friends, to look back on how we’ve valued our gifts over the past year, we look to our family of supporters in gratitude. The generosity of our community allows Seed Savers Exchange to carry out our role as stewards of America’s heirloom varieties, protecting our food and garden heritage for generations to come. We hope you’ll consider supporting our non-profit mission in the form of a tax-deductible donation.